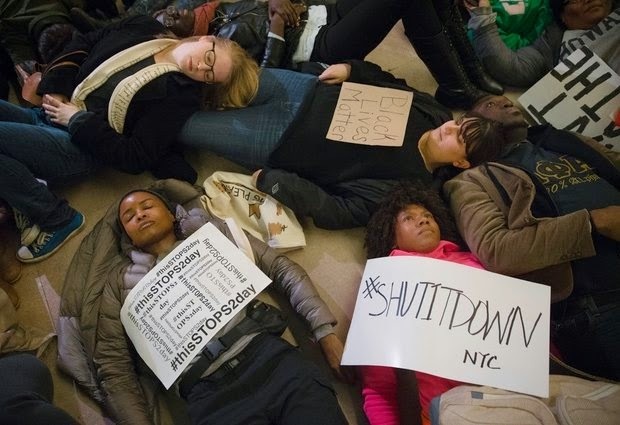 Protesters participate in a "die-in" at Grand Central Station during a demonstration against a grand jury's decision not to indict the police officer involved in the death of Eric Garner, Saturday, Dec. 6, 2014, in New York. NEW YORK (AP) — Protests of a grand jury's decision not to indict a white police officer in the chokehold death of an unarmed black man continued around the country, and authorities said a march in California turned violent when masked demonstrators smashed windows and threw objects at police. A Berkeley police officer received hospital treatment for a shoulder injury, while another sustained minor injuries after some of the protesters threw rocks and other projectiles, spokeswoman officer Jenn Coats said. She said several businesses were looted and damaged during the march, and officers attempting to get the crowd do disperse used tear gas. There have been no reports of any arrests. Thousands of demonstrators have protested peacefully in New York and elsewhere since the announcement Wednesday that a grand jury would not indict a white officer in the death of Eric Garner, a black man who gasped "I can't breathe" while he was being arrested for selling loose, untaxed cigarettes. The decision closely followed a Missouri grand jury's choice not to indict a white officer in the fatal shooting of Michael Brown, an unarmed black 18-year-old. The scope of the demonstrations and the lack of violence were moving to Garner's mother and widow, they said Saturday. "It is just so awesome to see how the crowds are out there," said Eric Garner's mother, Gwen Carr, who added that she ended up stuck in her car after protests shut down traffic. "I was just so proud of that crowd," Carr said. "It just warmed my heart." Garner's widow, Esaw Garner, said she saw demonstrators from her apartment window and told her son, "Look at all the love that your father's getting." Officers have said the outcry over the grand jury decision has left them feeling betrayed and demonized by everyone from the president and the mayor to throngs of protesters who scream at them on the street. "Police officers feel like they are being thrown under the bus," said Patrick Lynch, president of the police union. Garner's family members joined the Rev. Al Sharpton later Saturday as Sharpton laid a wreath at the site on Staten Island where Garner died July 17 in a confrontation that started when police tried to arrest him. An amateur video seen by millions showed Garner gasping, "I can't breathe" during the fatal encounter. "All we're concerned about is justice from the police," said Garner's stepfather, Benjamin Carr, who wore a T-shirt with the words, "Enough is enough." Protests continued in New York City for a fourth day with several dozen people lying down on the floor of Grand Central Terminal and marching into stores in Times Square. There were no reports of arrests. Protests have also been held in Philadelphia, Chicago, Miami, Las Vegas and a number of other cities. In Seattle, several hundred people marched downtown to police headquarters Saturday. Authorities said a group then split off from the main protest and tried to get onto a roadway. Police say some protesters threw rocks at officers who blocked them from entering it. Seven were arrested.